I know there are a few of you reading this hoping for me to provide a direct road map for finding the “best” school for your child. However, just like I say to my students at Fusion Academy, my philosophy is more about the journey in preparation to finding the right fit and the right environment. The right setting will best help your student continue to develop their own strengths while learning tools to overcome their struggles or weaknesses. This journey and process is all about embracing the kind of learner your student is, and using that knowledge to help guide you. My background in post-secondary counseling as well as middle and high school admissions has given me the opportunity to explore with students who they are as individuals and who they are as learners. Like the college search, finding the right middle and high school can be overshadowed with finding that big name school, because as we have all heard many times, finding that big name also brings prestige. However, I am passionate in helping families understand that a certain name doesn’t always equal the right fit and doesn’t always help students reach their fullest potential. Step one of my process, and something I encourage strongly, is to sit down with your child and help them understand who they are as a person. This is not only a benefit for finding the right school, but can also help build confidence and self-esteem for your child – factors that we know are important for resilience and success in school. (This can also be a great chance to bond with your student as well, learning more about his or her inner thoughts and even telling him or her more about your own experiences in middle and high school.) By taking the time to include your child in the process and find out what has worked in their schooling career so far can help make your son or daughter feel empowered in the process. I have seen first-hand how an empowered student has a new sense of motivation in their education. Step two is all about getting out there. Touring each school you and your student are interested in, even the ones you might not agree on, is key. While touring each school, don’t be afraid to ask questions specific to your family. I say not to be afraid because by not asking or telling them about a struggle you have can paint a different picture and might not show true compatibility. At Fusion Academy we do a three hour shadow day for every student who is interested in attending. We have students come in for two classes to observe what our classroom approach is like, as well as during lunch so the student can interact with current students they might be attending school with. If a shadow day is not possible at a school you are interested in, I encourage you to find a current student to talk to, to hear about their experiences. Step three encourages a full circle approach. Reflecting as a family, perhaps over dinner one night, and providing a space for everyone to share their thoughts and opinions can be a positive way to collaborate as a family. During this opportunity take notes to visually see what each family member liked and didn’t like about each program. For younger students, try making it into a game, like Memory, in order to make it a bit more fun and engaging. My final advice is to enjoy the process. Even though it can seem overwhelming and complicated, it is important to go into it with an open and engaged mind. Going through these steps now will absolutely help in the college process as well since it will be revisiting many of the same steps and helping your child see the progress and change over the many years since the middle school process. 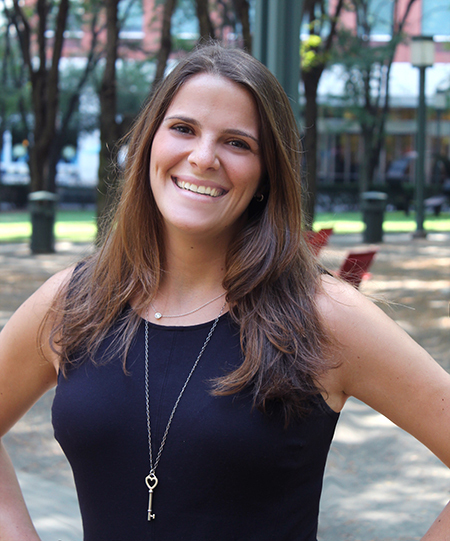 Sarah Bernstein is the Director of Admissions and Outreach at Fusion Academy Brooklyn. She earned her Bachelors Degree in Psychology and Sociology from Hunter College and a Masters Degree in School Counseling from New York University. Before starting her journey at Fusion Academy, she worked with her students focusing on important life skills, specifically on social and emotional learning in order to achieve academically, as well as working intensively with her students on their college applications. Sarah has continued this work with her students since beginning at Fusion Academy and has most recently stepped into the role of Director of Admissions and Outreach. In this role she is able to help families navigate their journey in finding the right middle and high school. She provides a safe and comfortable space to explore the many options that students can choose from and emphasizes the idea that there are many ways to reaching those personal goals. In her free time Sarah is an avid runner and sports enthusiast. She is a strong believer in a holistic approach to being happy and healthy.